Raw gaming capabilities come to the living room with a beautifully integrated sleek design. PiixL has released its highly anticipated, top-performance gaming machine on Kickstarter: G-Pack. G-Pack’s innovative slim design enables it to mount invisibly to the back of any TV via its VESA Flat Display Mounting Interface. It fits any TV from 37” to 70” in size and extends in width to leave access to USB Ports, Blu-ray drives or Flash Card readers, even when wall mounted. Measuring a mere 52mm at its maximum thickness point, made of ultra-light aluminium and virtually invisible, it is the least obtrusive yet most powerful appliance to enter the living room yet. G-Pack can be controlled from a simple gamepad using Steam’s “Big Picture” as its primary interface. This Steam Client offers access to the largest games library in the world and some of the most popular games ever made, at the same time bringing a stunning, console-like interface to PiixL’s powerhouse while retaining all of the PC’s inherent qualities. G-Pack takes gaming to an entirely new level with HDMI 2.0 and H265 HW Decode, courtesy of Nvidia’s latest Maxwell graphics cards, up to 3 Terabytes of storage and Core i7 processors - making it the perfect living room essential for every gaming enthusiast. Designed around PiixL’s cutting edge dual stage cooling architecture, G-Pack uses a new generation of centrifugal fans to stay cool, quiet and fast. The innovative cooling subsystem draws in and expels air from the side of the machine, guaranteeing complete thermal isolation from the TV it is attached to. Exclusive, high-tech centrifugal fans let the machine remain inaudible and capable of running the latest games at maximum setting and 60+ frames per second. 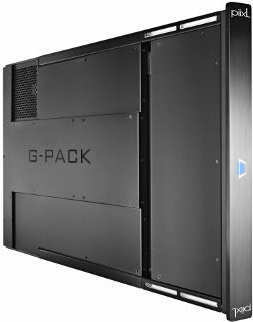 G-Pack will run in 3 configurations - ranging from $1,595 for the Core i3 version to $2,595 (including shipping) for the Core i7 variant. A specially designed Limited Edition, with a full silver anodised finish, will also be made available for the duration of the Kickstarter. Exclusively for the Kickstarter campaign, the G-Pack empty chassis will also be available for sale, for an early bird price of $445 (incl. shipping to the US), for those who wish to build their own G-Pack. PiixL Technologies Ltd is a London-based start-up that was founded in 2011 following the success of its iconic EdgeCenter concept. The G-Pack is its first true gaming machine aimed at a broad audience. The result of many months of development and refinement, G-Pack embraces the digital living room revolution with a beautiful, high-performance and open hardware platform.